The cutthroat competition in the e-commerce industry has made it is very difficult to stand out. But despite the market saturation, only a few companies rule the entire e-commerce sector. 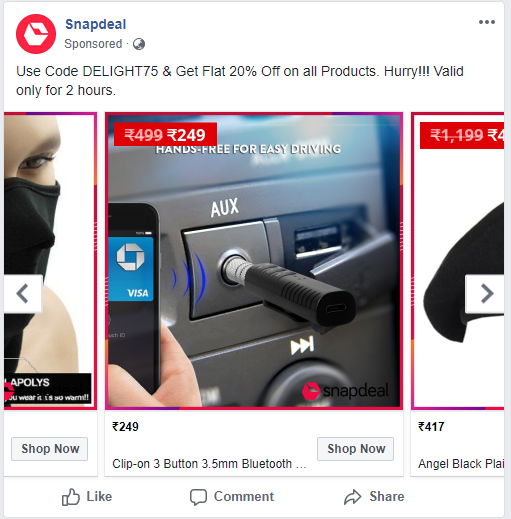 The reason behind this is their ability to convert their traffic effectively i.e. they have grasped the fundamentals of conversion rate optimization. Let’s look at 8 lessons you can learn from e-commerce giants like Amazon, Walmart, Flipkart, BestBuy etc. to skyrocket your conversions. Contrary to the popular belief, having too many choices often leads to analysis paralysis and makes it difficult for people to make a decision. When it comes to increasing sales, your primary goal is to increase conversions. The rest is just noise. Therefore on the product page, make sure that the call to actions such as Add to Cart or Buy Now are prominent. If you need to add anything else on the webpage, make sure it gets the least prominence. Keep some whitespace on the page that will direct the shopper to your primary CTA. 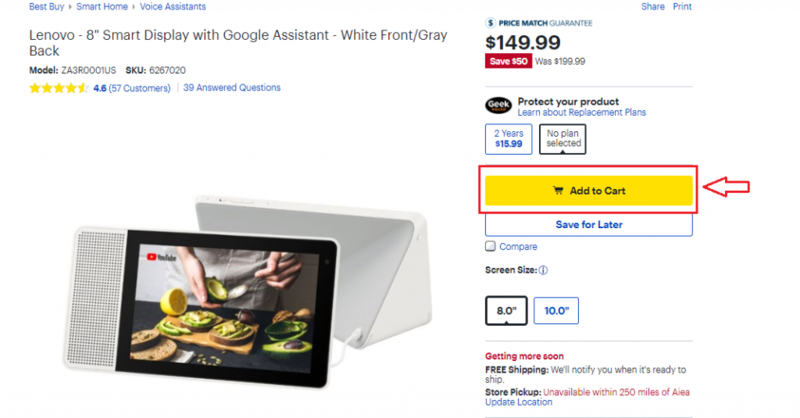 If you see Best Buy’s product page, you will see that the Add to Cart CTA gets the first precedence among other links such as Save for Later, Share, Print etc. When you restrict the availability of certain products on your website, you unconsciously make buyers perceive those products attractive or hard to get. This tactic works because of the fear of missing out (FOMO). 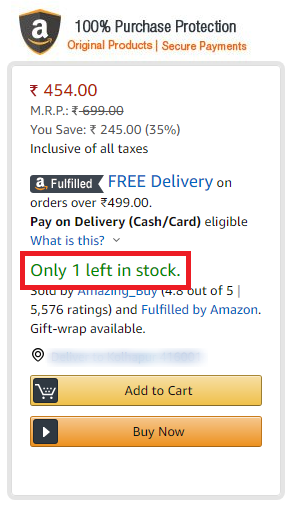 Quantity-based scarcity: Hurry! Only 2 left in stock! Scarcity works because when the buyers know that the product is easily available, they’ll delay the decision to buy it. But when they know the product is limited in stock, it won’t take them much time to take out the credit card from their wallets and complete the purchase. There’s one caveat when it comes to creating a sense of urgency. Scarcity works only if your product is genuinely scarce in the market. You can’t create quantity-based scarcity for products that are easily available in other stores. In such cases, only time-based scarcity supported by offers would work. The survival of human species was possible because of our tendency to work as a collective unit. Therefore we are inclined to conform to the interests, preferences, and opinions of the group we are part of. Social proof banks on the same principle. Social proof for e-commerce stores is mostly product ratings and reviews. 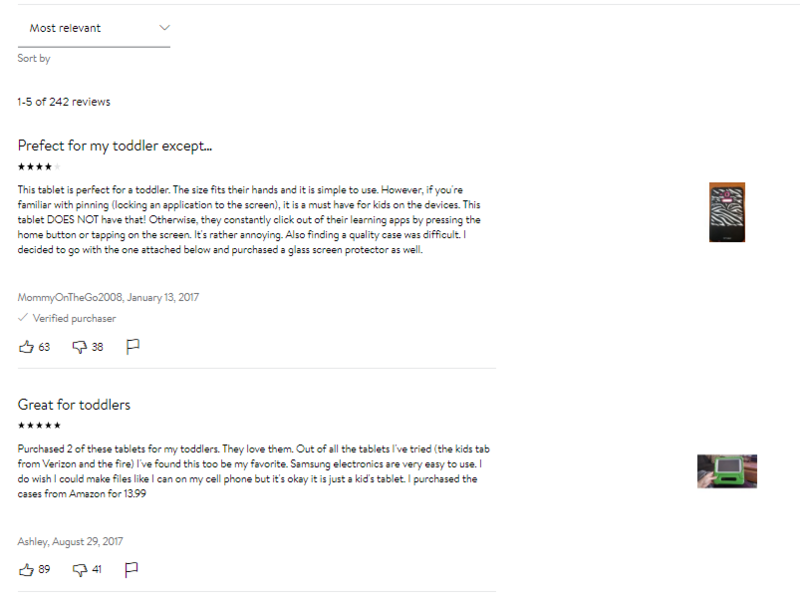 When you’re shopping for a product online, almost inevitably, you’ll scroll down to the bottom of the page to read the reviews of the product to see if it is worth buying. You completely skip the part of promotional content put up by the company. In the above image, you’ll notice that the ratings are put right below the product name to showcase the trustworthiness of the product. A clever hack to social proof is when you select the Most relevant filter, you’ll always see the positive ratings and reviews of the product. Now you might think that it’s a no-brainer, but it’s astonishing to see how many brands don’t do it. When you highlight your top-selling products or festival discounts on your homepage, you’re luring them into checking them out and eventually buying them. 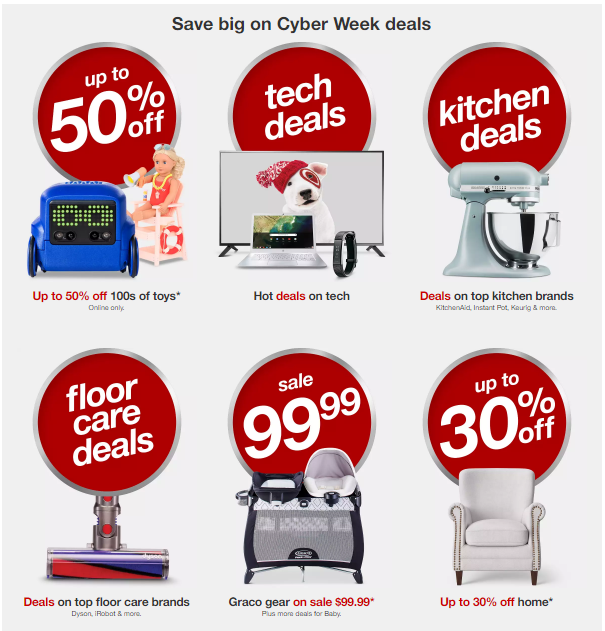 Here is an example of Target highlighting their Cyber Week offers. 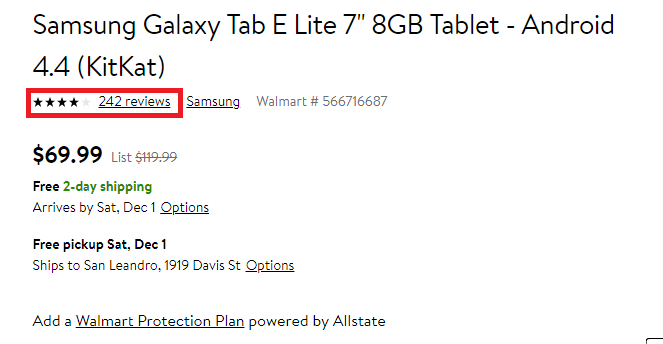 If you see Walmart’s homepage, it’s very different and doesn’t explicitly state the discounts. Brands can no longer fight over product features or pricing. Sure, it will bring you a short-term lead, but if you want to run a marathon, you need to use customer experience as the key differentiator. How you treat your customers is very important. If you treat them well, you don’t have to worry about retaining them. One way to do this is via customer support. During or after making a purchase, a customer might have some queries. How easy you are accessible to them decides whether they will buy from you again. Live chat and policies strongly reflect the company ethos and what sort of customer experience your store strives to provide. 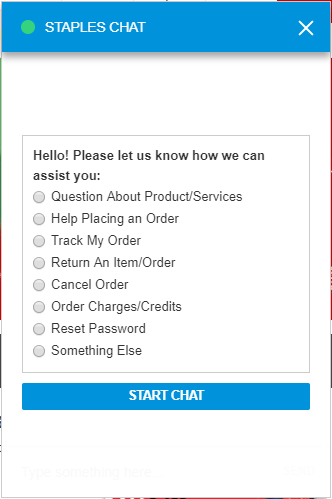 Staples provides live chat support on their website. 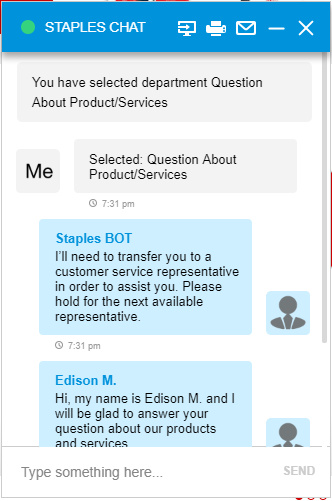 When you click on the right-hand side pop-up, you are routed to a customer service rep through the Staples BOT. Another way to solidify CX is through shipping and returns policy. Customers are often hesitant about buying online because of the returns policy. Jabong, an Indian e-commerce company, puts all questions to rest by being loud and clear about their shipping and returns policy. Amazon gives a simple explanation of their returns procedure. 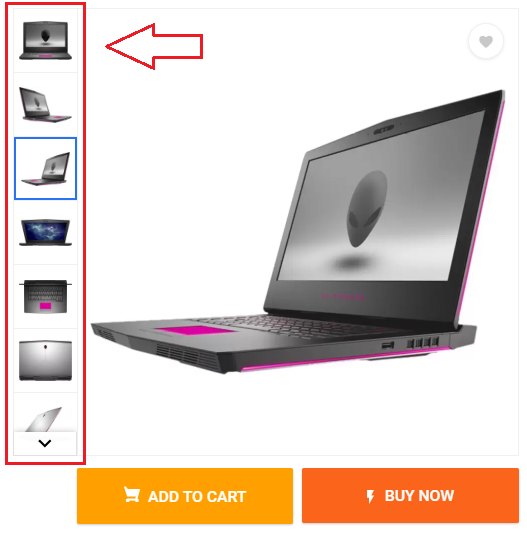 To solve any potential queries a user might have, Flipkart puts up high-res photos of every product which zoom-in when you hover the mouse over them. The almost invisible dotted rectangle in the image below denotes the mouse hover. To increase revenue, along with reducing cart abandonment, it is also necessary to increase cart value. This can be done effectively through upselling and cross-selling. But there’s a catch. Blatant implementation of this tactic might result in more cart abandonment than sales. To do this in a way that works for you, you need to personalize the shopping experience of the buyer. There are approximately 2.53 billion smartphone users across the world. The purchasing online trend is no longer limited exclusively to desktops. To bank on this market, you need to be where your audience is. i.e. smartphones. Along with mobile apps, it is necessary to have a mobile website as well. Although a mobile app might help you in personalizing your services, not everyone is willing to download and use your app. Flipkart tried this tactic and did not succeed at all. Having a mobile website will allow your users to have the same experience as your desktop contemporary. The reason why these e-commerce websites have become giants is that of their strategic approach towards every element on their website. Of course, having major financial investment gives a strong headstart, but the rest of the success depends on how well you are able to scale it. If you are looking to increase your onsite conversion rate, tactics mentioned in this article are a surefire way to set you on the right part. Let us know which tactic are you going to implement on your website?